To usher in the new year, 4 fleets clashed in Kourmonen, the Bleak Lands. The fight, which occurred on the Huola gate, saw a Tempest battleship fleet engage several other gangs including a mixed shield cruiser fleet, a Rattlesnake battleship fleet and a Confessor tactical destroyer fleet. F4R2-Q in Catch saw the first major offensive in the war over the region between Stain Wagon (SW) coalition to Stain Fraggin’ (SF) coalition. 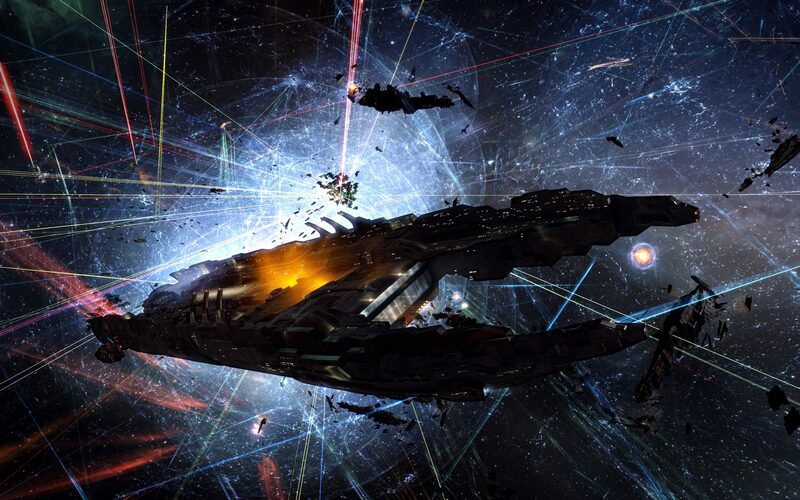 The former, supported by Goonswarm Federation [CONDI] attempted to destroy 2 Fortizar citadels belonging to member alliances of the latter, namely Circle-Of-Two [CO2] and Test Alliance Please Ignore [TEST]. The subsequent fight saw 4,000 pilots fight for 9 hours straight over the fate of the citadels. DO6H-Q in Fade saw an Adversity. [AVRSE] Armageddon Navy Issue battleship fleet engage a Guardians of the Galaxy (GotG) coalition Ferox battlecruiser fleet on the U-INPD gate, with Brave Collective [BRAVE] bringing a Maller cruiser fleet as a third party. The three clashed on the gate, with the fight continuing later on in E-9ORY. Battle report for DO6H-Q can be found here, and E-9ORY here. 2/1 Did he say Jump and Lazerhawks versus WAFFLES. Bosboger in Heimatar saw a tower defense mounted by Did he say Jump [JMP-N] and Lazerhawks [LZHX] with a Machariel battleship fleet, facing a similar fleet by WAFFLES. [N0MAD]. The two sides clashed in a close range brawl on the tower. PNQY-Y in Fountain saw a final timer for a Fortizar citadel belonging to LowSechnaya Sholupen [-LSH-]. The attackers, The-Culture [-T C-] fielded a Rattlesnake fleet, supported by a Northern Coalition. [NC] Proteus strategic cruiser fleet engaged LowSechnaya Sholupen in the system, who had formed a joint Tempest battleship fleet with Red Menace (RMC) coalition and was supported itself by a SW Gila cruiser fleet. The two sides clashed on the RP2-OQ gate before moving the battle to the citadel itself. 5/1 Did he say Jump versus WAFFLES. Siseide in Heimatar saw Did he say Jump defend an Azbel engineering complex from WAFFLES. Did he say Jump brought a Rattlesnake fleet, while WAFFLES. had a Machariel fleet. Both sides fielded capitals in their battle, meeting on the Azbel itself. Great info. Lucky me I came across your site by chance (stumbleupon). I have book-marked it for later! I just want to mention I am just all new to weblog and definitely loved you’re web-site. More than likely I’m want to bookmark your site . You really have awesome stories. Bless you for sharing your web-site. Thank you for this great post! It has been extremely helpful. I hope that you will carry on sharing your wisdom with us. I’m wishing to look at blog sites containing songs I such as, but sorting through all the detached, outdated as well as crap blog sites is a headache. I know there are hundreds of blog sites, is there an excellent source to seek out the preferred ones?. I intend to start a blog site where I can talk to people as well as have them reply to my blog sites. Not myspace or facebook. I tried blogger however the only blog sites I can locate were about international warming and also weapons. I desire some where that I can open an account and claim what I really feel and people respond to my blog sites and I can react to theres. If anybody can aid me that would certainly be fantastic!. I really wanted to write down a small comment in order to thank you for those awesome guidelines you are placing on this website. My particularly long internet research has at the end been rewarded with extremely good facts and strategies to talk about with my close friends. I ‘d repeat that many of us visitors are really endowed to exist in a good site with so many brilliant individuals with interesting tactics. I feel very much grateful to have come across your entire site and look forward to so many more fun moments reading here. Thanks once more for a lot of things. c5CAKd You are my breathing in, I own few web logs and occasionally run out from to brand. Hey, you used to write magnificent, but the last few posts have been kinda boring¡K I miss your tremendous writings. Past few posts are just a bit out of track! come on! Wq0yYC Search the Ohio MLS FREE! Wondering what your home is worth? Contact us today!! I’m finding them for my sis. I’m looking for the most dishes with images as well as the ages of child for the dishes. Blog sites are typically where I would certainly expect to find them. When I initially left a comment I seem to have clicked on the -Notify me when new comments are added- checkbox and now whenever a comment is added I get 4 emails with the exact same comment. Perhaps there is an easy method you can remove me from that service? Thanks a lot! feedback? If so how do you prevent it, any plugin or anything you can advise? Leave a Reply to Gale Pilkins Click here to cancel reply.